This essay is not a manifesto. That is the first point I wish to make before addressing anything else: here is a distillation of my notes that constitute a general outline, a meta-practice, whose role is situative and not prescriptive. It is a matrix of potential avenues for consideration and development in my own work that may also be of interest to others. This annotation of historical tendencies and approaches is focused on how disparate Formal claims made for motion pictures (film, video, digital) may be grouped so they present themselves as ‘categorical variations’ rather than ‘innovative ruptures.’ In this regard, the resulting essay is programmatic in its descriptions, inclusive as opposed to reductive (or “pure”). This is my partisan sketch (fragmentary) of some historical continuities, not just between different avant-gardes, but between commercial media generally and those avant-gardes. The diversity of formal experiments that have defined the various theoretical approaches to “avant-garde film,” “video art,” and “new media” are marked by a heterogeneity that makes the general grouping of practices as diverse as Eisensteinian montage and Tony Conrad’s Delicatessen and the commercial feature Close Encounters of Third Kind not only difficult, but an endeavor that borders on the absurd. My discussion of media theory-history herein is precisely absurd: it outlines an expanded framework for relating these disparate approaches to one another, by suggesting a general approach to thinking about motion images without the traditional “formal” limitations of physical medium-specificity—analog/digital, film/video, DV/HDV. . . The limits and problems with importing ‘medium-specificity’ from traditional media such as painting becomes apparent when confronting any art form developing from a technological foundation: which parts of the technical apparatus are the ‘pure’ dimensions?—what the answer is for this question determines the results in advance of any formal experiment that follows. Defining the medium as a specific set of Formal effects creates a limiting framework whose constraints on aesthetic development are well known; this is Greenberg’s “use of the characteristic methods of a discipline to criticize the discipline itself” (what is known as ‘medium-specificity’—the formal effects based in an ontological essence particular to a specific medium alone) from his essay Modernist Painting (1960) where he argued for Formal “purity” as the necessary and sufficient condition for serious, important art (by which he meant “painting”). This ontological limit makes discussing these differing Formalisms together problematic because of their incompatibility. When this view of Formalism encounters works that fall outside those demands, it rejects those works as being insignificant or “bad” (if it acknowledges their existence at all). This rejection is the heritage most commonly connected to Formalist art, and it is one that creates the illusion there is nothing more to do except a reiteration of earlier work formally, conceptually, or in direct repetition-quotation. Alternatives are neutralized in advance of their proposal; historical ‘medium-specificity’ has been rejected in composing this expanded framework. Expanding the framework of potentials in opposition to a Formal description based on an ontological “essence” (this is what any claim of “purity” is about honoring) begins with an empirical foundation in the already-known historical media, rather than a theoretical approach that ignores precedent for philosophical meditation. By providing a range of specific examples, my approach delineates a sense of the breadth for the parameters under consideration. Adopting such limitations, coupled with the implicit demand that every instance be given equal weight, forces a divergence from earlier medium-specific Formal conceptions. These are the assumptions guiding this set of notes. The physical limitations imposed by material supports provide the points of liminal extension; in the case of motion pictures, these liminal parameters have been the historical loci that form the basis of historical film movements, both within the avant-garde and outside it. There are six ‘material’ dimensions to this technology that have historically been the focus of formal innovation in motion images: the camera, the image itself, the editing (or sequencing of images), the projection system, the screen and, finally, sound and/or silence. In my discussion, there is more to say about the historical development of image-based and editing-based formalisms simply because those two arenas received the greatest attention by Formalists engaging motion pictures; the physical support, or ‘base,’ might seem a neglected seventh arena in my analysis, but any appearance of “the base” in a movie is actually a transferal from the unseen realm of material-supporting-image to the specifically visible space of image-itself. This expanded framework is offered as a tool to facilitate getting outside of established Formalisms and the leftover conceptual limits created by our Modernist heritage. This approach is an attempt to grapple with the heritage of motion pictures: to escape the past, we must first understand it. The motion picture camera is simultaneously the most necessary component for most motion pictures, and at the same time is left unconsidered, a “given” only an indirect consideration (via its role in image production). Every new type of camera—format, portability, shooting speed, etc.—has opened new possibilities as much as it has resulted in the development of new shooting styles. As Paul Virilio’s history of motion pictures documented, motion pictures were used as a military technology focused on surveillance of enemy lines during World War I. The demands of this aerial recon created the new smaller, highly portable, lightweight cameras that allowed Able Gance to explore new kinds of shooting in the 1920s in films such as Napoleon, whose uses of these cameras included firing a camera out of a canon and throwing one across the field during the famous snow-ball fight sequence. These shots would not have been possible without the new cameras; the development of the American film avant-garde following World War II is partly related to the general availability of small, portable 16mm cameras and film stock (both military surplus and readily accessible in NY, as Jack Smith commented about the stock used for Flaming Creatures). However, the impact of innovation on camera technology is especially obvious in the history of video cameras which were initially physically tied to a studio shooting system, and which required an immediate, live broadcast of their subjects. The movement away from large, studio cameras to progressively smaller devices; the inclusion of video cameras in cell phones and as an option for almost all digital still cameras makes the creation of movies into a common practice. Camera design is principally a technological concern, whatever aesthetic it enables. 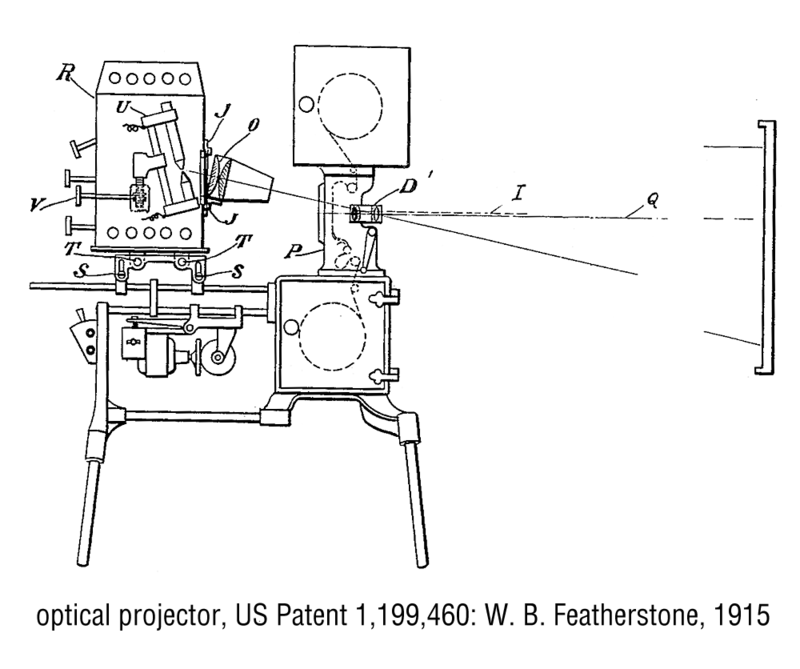 Many designs for new types of motion picture camera are registered in the United States Patent Office, including the original technical descriptions for what have since become standard solutions to the exposure and ‘storage’ of exposed film frames: variable shutters, registration pins, sprocket holes, etc. These now-standard developments have become the normal, even expected, components of high quality film cameras; a comparable series of innovations have shaped the design and construction of video cameras. 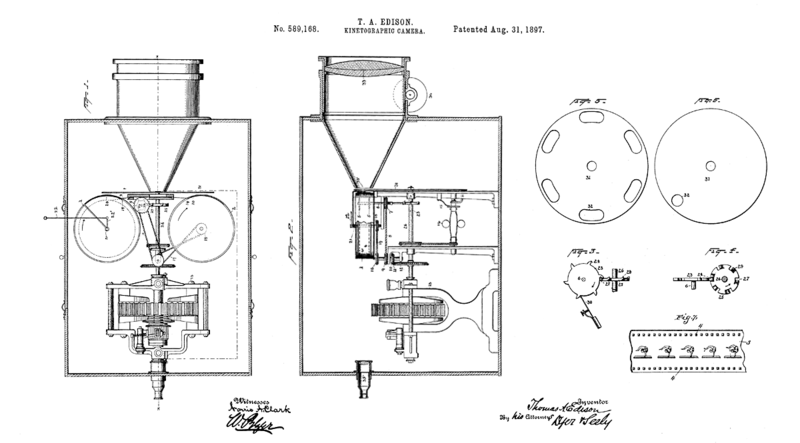 These patents document a myriad of other designs—such as a roller system that does not require any sprocket holes, or the alternative systems for synchronizing sound to camera/projector developed prior to the general adoption of optical sound in 1929—that present avenues of technical development not followed. Even though the design of the camera is often accepted as a given—specific frame rates (24 or 18 fps typically), a particular aspect ratio—the optical components of the camera have been subjected to physical interventions to produce distorted or “abstracted” imagery. These types of addition or subtraction from the lens system belong under a broad heading of “camera interventions.” Interventions in front of the lens are a common means to altering how the camera produces imagery, a factor common to even the earliest avant-garde works: Dudley Murphy employed prisms and mirrors in shooting Ballet Mécanique, Man Ray applied vaseline to the lens for several of his films, Stan Brakhage consistently found ways to add distortions . . . these ‘preparations’ change the functional nature of the optics while still producing material that can be handled in a traditional way. While there is a large repertoire of camera-based effects and technical manipulations, there is no ‘avant-garde’ engagement with film that is only associated with camera manipulations: these techniques occur as part of an aesthetic approach to imaging that is directly associated with some other more dominant approach, such as editing (as was the case with both Montage and the Long-Take), or through image-based aesthetics (as with Surrealist film generally), or with the procedural application of rephotography and optical printing (in Structural Film). While it is possible for films to exist without images, Walther Ruttmann’s Wochende being the most famous of these audible film works, generally the image is also accepted as a necessity for the existence of a film. (The unprojectable conceptual films (as with Tony Conrad’s Delicatessen, where the film is processed using methods that result in films that cannot be projected) are a subset of Formalist experiments with the “visual foundations” for movies—the nature of the image/base relationship. The base remains invisible, whether it is film, video, analog or digital in nature. Those interventions and explorations that are strictly directed at the base itself are relatively unusual: Tony Conrad’s Delicatessen, a film series based on various picklings, fryings, and processing of film stock that do not result in a projectable film should be recognized as explorations of the base. Conrad’s approach is the more extreme version of alternative chemical processes that develop the film base. 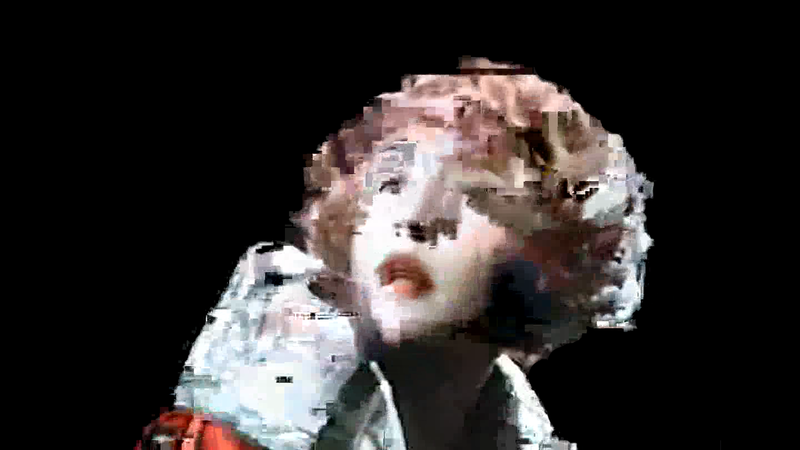 Those databending and glitch techniques focused on editing and alteration to the digital codecs used to render a digital video viewable, rather than the movie files themselves, parallel Conrad’s project. When it does appear in a movie, the ‘base’ has become image—and as such is no longer only the “physical” support for that image. Various translations of the base into image—whether through decay, scratches, or other technical glitches—offers the possibility of new categories of imagery precisely because the images being produced do not depend on the physical interactions of optics and light for their existence. Cross processing, baking (as in Barbara Hammer’s Nitrate Kisses), or the decay of nitrate stock over time (Bill Morrison’s Decasia), or the appearance of digital artifacts (as in any glitched work) are all examples of the “film base” becoming the focus, with the results necessarily becoming visible as image. This transfer is the foundation of George Landow’s Film in which there appear sprocket holes, dirt particles, etc. where the dust, scratches, and other wear produced as a result of projecting a movie many times is artificially produced through optical printing of a film loop, with the resulting decay becoming the focus as the title suggests. ‘Materialist’ approaches to motion pictures commonly emphasize visual artifacts created by manipulation of the “base.” Artist/critics such as Peter Gidal make these ‘material’ markers of the physicality of the celluloid medium central to their (political) aesthetics based in opposition to the (supposed) ‘perfection’ of commercial productions and the spectacles they so often contain. However, the claim that these visual traces are anathema to commercial cinema can be readily dismissed—they have already been used in commercial film—for example, both in Orson Welles’ Citizen Kane (in the opening newsreel) and in Woody Allen’s Zelig (simulated archival documentary materials of all types), as well as contemporary digital works that simulate the dust, grain, and physicality of celluloid. Gidal’s political meaning for these material signifiers is based in a theory that revelations of the base inherently provide a critique of the entertainment industry (following Theodor Adorno’s Marxist critique in Aesthetic Theory); yet, this is not necessarily the case. The appearance of technical glitches (dirt, scratches, artifacts, macroblocks, et. al.) is not a guarantee of critique any more than their presence in a motion picture is necessarily “non-commercial.” Such questions have much more to do with semiotics. The movie’s meaning should be recognized as a result of the aesthetic structures organized through the motion picture’s development, rather than some type of inherent property—the assertion of an inherently critical mode is a reification of Formal ‘purity.’ As commercial film so clearly demonstrates, the signs of technical failure—dust, grain, scratches, artifacts, etc.—can be mobilized to create the illusion of a historical movie, or to imitate the appearance of physical materials with digital means, and these formal uses are quite separate from whatever meaning those “failures” might have in the work. With digital materials the tendency has already been to make exactly the same “Formal” claim for works that manipulate digital files (databending, datamoshing, transcoding, etc.) to emphasize the unexpected or ‘glitched’ result as a demonstration of what the digital “really” is, (as for example, Rosa Menkman’s writing on “glitch art” shows). The types of formal claims made for ‘glitch’ in opposition to ‘typical functioning’ correspond to similar claims made for video in opposition to television in the 1970s (see, for example, David Antin’s essay/manifesto “Video: The Distinctive Features of the Medium”). The ‘bringing into consciousness’ of the base of a motion picture is directly relatable to how important connections between other visual arts (typically painting, and to a lesser degree sculpture and photography) are to the particular Formalist conception of the motion image and its “material basis.” Specifically following earlier theoretical and aesthetic developments of ‘medium-specificity’ in traditional art, transferred to a “new medium” have served to limit both the types of visual developments and their interpretation. The earliest movies were single shots that contained the entire action of the movie, often from a static vantage-point. The workers leaving the Lumiérè factory is a case in point here: the movie begins, the doors open, the workers leave, the doors close, the movie ends. All movies involve editing, even if the final form of the work is a loop: it is of a specific duration—loops do involve a repetition of material, thus presenting a minimum duration—even in those cases where there is no other editing. Yet it is the editing and organization of disparate clips that provides the most enduring and largest range of avant-garde practices historically. The Hollywood system of Shot/Reverse-Shot cut into a Master (one of the first systems in use—fully emergent by 1920—and subverted in Luis Bruñel’s Un Chien Andalou) was historically followed by “Soviet Montage,” a system specifically meant to be avant-garde and revolutionary, documented and promoted like so many other avant-garde of this period in polemical texts, manifestos and absolutist declarations that all other approaches were “dead” and “wrong” (claims Eisenstein was forced to abandon in the 1930s when montage became unfashionable in the USSR). These prescriptions are common to Modernism before World War II; “Soviet Montage” is typical of these Formalist theories of art (not just media). The use of pre-existing materials, most prominently by Bruce Conner, but also by Joseph Cornell, and more recently in various types of ‘remix’ are all variations on an approach that focuses prominently on the editing and sequencing of images. In the case of appropriation practices, this basis in editing is to the exclusion of almost all other concerns: the main issue in these works in the results of the assembly and organization of the imagery itself. This development is typical of editing-based approaches to motion pictures, as are the linguistic metaphors employed as intellectual and conceptual support. Is not this process that of the ideogram, combining independent “mouth” and the disassociated symbol of “child” to form the significance of “scream”? It is this emphasis on the specific content of each particular image that is determinate of the meaning and affect of a particular montage. The distinctions between one system and another are not about the particulars of how it is edited so much as the role that the image content plays in the particular structure of the resulting sequence. This underlying uniformity is what enables us to differentiate between the linguistic functions of Soviet montage and those apparent in works by Bruce Conner, Craig Baldwin, or Pablo Ferro. It is a matter of particular images assembled, in what order. Innovations in editing and sequence are thus as much about what has been edited as they are about the organizing principles that determine the editing. Alternatives to a linguistic model are possible, and have been developed already, for example musical approaches to editing are already contained by Soviet/Eisenstein theory. However, editing through graphic match or the locus of attention (as described by Walter Murch) are alternatives to the linguistic model of montage is distinct from its limitations, as is the assembly of multiple images on the same screen (so-called “spatial montage”), or with multiple overlapping screens. The tendency to link projection with the theatrical motion picture is obvious, yet it remains the element, like the base, that is invisible until it becomes the visual focus of the work. The historical importance of projection becomes apparent at the origin point for experiments with motion pictures by artists: the Futurists began their exploration of cinema as a new medium by dismantling and altering their projector. While its role in motion pictures appeared to be essential for much of the twentieth century, the projector has revealed itself to be a contingent element: flat LCD screens, unlike the cathode ray screen, do not have a projection element even though they emit light. It is also an area of formal development most often secondary to other concerns with image and editing. The use of multiple projectors to construct a singular, continuous image while dependent on the projection technology is primarily concerned with the resulting image. Formal engagements with projection, whether singular or multiple, tend to convert into either image-focused works or sculptural concerns with shaped screens and performance. A more discrete concern with projection as such is relatively unusual. Ken Jacob’s Nervous System is one of the most prominent and long-running experiments with altering the film projection system, but it is not the only such intervention in the mechanics of the projector. As with cameras, it is possible to intervene in the projection by removing, altering or adding to the lens system of the projector. Changing the placement and orientation of the projector in relation to the screen can have similar results, as can alterations to the projection speed (fps). Apparent motion is contingent upon the projector’s functioning in a particular fashion, presenting a specific number of frames at a particular rate per second. The fps (frames per second) is a basic concept in apparent motion, common not only to film, but present as a reference point in video, computer animations, as well as the 19th century persistence-of-vision machinery such as zoetropes. The higher the fps rate, the smoother the motion appears. Multiple projection was one of the central developments of expanded cinema in the 1950s and 60s tended towards the performative. Andy Warhol’s Exploding Plastic Inevitable is as typical of this engagement as the shows by Single Wing Turquoise Bird or Stan VanDerBeek’s environmental theater, the moviedrome. Contemporary video installation continues these sculptural concerns, as in Tony Oursler’s projections onto dolls that demonstrate the inter-dependence between projection and types of sculptural, shaped screens used to display the projection. Even within the commercial film industry, the aspect ratio of film production has not only changed over time, it has varied from studio to studio and production to production. Yet, as variable as this part of the movie can be, it is still constrained by the technology used to present it. To make changes requires that the technology itself change. For the purposes of this consideration, it is these integral changes that are of concern, rather than the potential to ‘cut down’ through masking the shape of a standard image. This integral nature of the image shape to the technology to make the images is mediated by a second technology—that used to show the movie itself: the screen whose aspect ratio, curvature, etc. are all determinate of the actual movie in an interaction with the projector. The result of this combination of projection and screen means the shape of the screen results from an interaction with the aspect ratio of the images ‘projected’: screens can be larger or smaller, but the perception of its dimensions depends on the shape of the image presented. A screen which is the same shape as the projected image is simply a surface which presents the image in its entirety. Introducing what might be considered “flaws” into the screen that parallels the formal development of issues relating to the base. Thus, any object can become a screen. The human body as screen has been explored intermittently since the 1920s. In 1926 Man Ray installed a projector to project a hand-colored film by Georges Méliès onto a white dance floor where all the dancing couples were dressed in white, producing a moving screen for his images. This interactive screening also appears in video installations such as Dara Birnbaum’s Rio Videowall where twenty-five monitors showed two sets of imagery: one set was the shopping mall where the piece was installed, the other drew from news broadcasts, using the bodies of the viewers as masks to contain the mall footage. Sculptural screens either as objects in themselves (Nam June Paik’s TV sculptures and installation works engage screens in this way) or as ‘supports’ for projection and/or LCD screens bring the physicality of the screen into view as an integral part of the motion picture. This dynamic of screen-to-image is a common feature of works using projection mapping, where the particular dimensions of the building (or other surface) plays an active role in the ‘shape’ and motion shown. It is the integration of the screen into the work that shows the significance of the screen to the work shown on it. There have been several competing technologies for sound recording, with optical soundtracks being the most common until the advent of digital recording and play-back replaced it. And while there have been films such as Walter Ruttmann’s Wochende that are entirely without image, the element of sound appears in movies in two ways: it is either synchronized in a naturalistic fashion, resembling our actual lived experience of the world, or as a counterpoint to the imagery. Certain films, such as Jacques Tati’s commercial Les Vacances de M. Hulot play with these relationships, exploring the distinctions between synchronous and counterpoint uses of sound, a concern typical for the historical avant-gardes’ claims about sound as dialectal or independent of image. However, the absence of sound in a movie is often considered to be equivalent to that work being “silent”; however, there are few films that are genuinely created to be seen without sound. Andy Warhol assumed that the audience would provide the soundtrack to his “silent” films, while Brakhage’s ‘silence’ assumes that his motion pictures would be seen in actual silence—yet they were often shown with the projector in the room too, the projector noise creating a de facto unplanned soundtrack. For an audience to perceive a movie as “silent” means not that there is an absence of sound, but rather that they mentally ignore the ambient noises present during the projection; because this response is likely automatic, for a film to have an aleoric soundtrack—of they type Warhol suggests—the audience should be “primed” to not ignore the surrounding ambience of conversation and incidental noise. This essay is not calling for change. That is the final point I wish to make: these notes merely describe points of theoretical-aesthetic convergence apparent in existing media works; it is not a demand that this historical account of motion pictures is necessarily correct. This approach is description+purpose: the past century of developments in motion pictures appears complete, conclusive—it produces an illusion that everything which could be done has already happened. The idea that the present is thus “post-historical” serves to naturalize whatever configuration the present might be in while at the same time foreclosing on any potential for emergent, new alternatives. The present repetition of earlier innovations (whether within motion pictures or in the larger framework of art theory generally) reflects accepted fundamental assumptions of this ‘post-historical’ view that pass unquestioned largely because the Formalist prescriptions of ‘medium-specificity’ still structure contemporary analyses, but under different names; the inherently critical claims made for some types of media production are symptomatic of this relationship. The notion that motion pictures are based in photographic reproduction leads to a rejection of editing in favor of the long take; a meditation on the duration of shots leads to a systematization of editing in Soviet (and other variant) montage; the concern with the physicality of the film strip and its projection leads to works that emphasize the materiality of film and the photochemical processes used in its processing; each approach has multiple works associated with it that are consequently limited to exploration of the particulars of their medium. Each approach is valid in itself, yet they inherently pose an all-or-nothing conception of Formal “purity” dependent on how “motion pictures” are ontologically defined. Instead, relationships between a discrete, but interrelated, set of physical parameters used in all varieties of motion image identify technological potentials and established parameters that are already in use, suggesting the possibility for a lexicon of aesthetic approaches to the physical constraints of movies. Making points of continuity between distinct, historical Formalisms breaks down the isolation of independent formal dimensions. That these examples address “film” is simply an artifact of the history under consideration. These divisions between material media are arbitrary—they are derived from the ways that motion pictures have been employed by artists in making their work; however, they are also a reflection upon the technology itself and the specific potentials that technology has been built and developed to offer. The goal is semiotic in nature—to correlate the physical components to the conventions that inform the art form itself; the identification of these components is a first step towards that goal. Once identified, these conventions are available for a direct questioning and critical exploration without the constraints of Formal ‘purity.’ This expanded framework demonstrates the meshing of discrete approaches through mutual dependence, making it possible to imagine them as intersecting vectors historically seemed to be mutually exclusive Formalisms: the results identify conditions of possibility. These axes of technical development reinforce an emphasis on differences and divergences (a feature of the Modernist Formalism under consideration), rather than on the commonalities all these products of the same culture and technology have. The problem posed by the heterogeneous dispersion of historical approaches and practices has left only two options for artists working: the repetition (or continuance) of established tropes and forms, (which is the path to academic art), or the establishment of “new” manifestos that recreate the same all-or-nothing propositions of past movements and groups. Each of these options develops in part because there has been no theoretical model for the work of historical avant-garde and related motion image works that can accommodate the plurality and discontinuity between Formalisms. The neglect of contemporary work in favor of established canonical artists and works may be a reflection of this critical lapse. This expanded framework for motion imagery can qualify as a useful theoretical model if it satisfies two conditions: (1) it must be able to include the full variety of extant works easily and without the invention of special categories and conditions—it must be general; (2) it must be able to identify possibilities for future development and not require continuous radical revision or major alteration of the framework itself—it must be extensible. The first condition has been demonstrated even by the cursory survey presented in this discussion; the second will only emerge over time as new developments appear. By being clear about what has been produced and created it may be possible to avoid the dangers of becoming an academic art—even as the historical works and their aesthetic forms become subjects of the academy, and find their way into the coursework and training for artists working with motion pictures. I’m wondering what effect the availability of gear to lumpen elements via the agency of technological obsolescence might play on determining esthetics? The article mentions cheap 16mm cameras and film in the post WWII era leading to a larger base of film experimenters. Is there a direction that esthetics take once media tools become democratized to the point that it can eclipse the ‘”salon” version? Eisenstein gave us rapid cuts and rapid shifts of point of view. Bruce Conner and others gave us rapid shifts of point of view as texture with narrative story line secondary, if present at all; where content impinged subconsciously to a greater degree than consciously. What taboos may be left to break? Hand held verite broke the taboo of shaky images. You can’t hand hold a 200lb Mitchell. My proposition is that the original esthetic of a medium is dictated by the tastes of the ruling class- sharp focus, evenly defining lighting, sequential narrative story line, memorized script lines, etc., are not so much a product of the esotericity of the tools of the medium and their rarity due to expense, or due to the traditions of stage drama; but rather that they are the evocation of the esthetics of the society’s brahmins, the aristocracy, and mirrors the kinds of art we might find in their palaces. Sub 1 minute videos as seen on Vine, are not found in palaces. Would this suggest an evolutionary direction for motion image media when democratized? Could a full length dramatic feature film be watchable if no take was longer than 3 seconds? Will film stop telling us stories and start creating desired states of mind, ones that make us smarter?